Ir. Dr. Dominic Ong obtained his Bachelor’s Degree in Civil Engineering from the University of Western Australia (UWA) and his PhD in Geotechnical Engineering from the National University of Singapore (NUS). Currently, he is an Associate Professor and Director of the Research Centre for Sustainable Technologies, Faculty of Engineering, Computing & Science, Swinburne University of Technology Sarawak Campus. He is also actively involved in geotechnical consultancy works within the local industry and previously in Singapore. Ir. Dr. Ong has particular interests in the fields of deep excavation, tunnelling, soil-structure interaction, ground improvement, field instrumentation works, biocementation and finite element modelling. He currently supervises 10 PhD candidates in these fields. He also holds the position of Executive Committee Member of the Association of Consulting Engineers Malaysia (ACEM) Sarawak Branch, Vice-Chairman Institution of Engineers Malaysia (IEM) Sarawak Branch and is also a Founding Member of both the Malaysian Geotechnical Society (MGS) and the Malaysian Society for Trenchless and Tunnelling Technology (MSTTT). He is also an Editorial Board Member of the UK’s Institution of Civil Engineer (ICE) journal, Geotechnical Research as well as an Editorial Panel Member of the Southeast Asia Geotechnical Society (SEAGC)-Association of Geotechnical Societies in Southeast Asia (AGSSEA) Geotechnical Engineering journal. Recently, he serves in the International Society for Soil Mechanics & Geotechnical Engineering (ISSMGE) Technical Committees, namely, TC104 Physical Modelling and TC207 Soil-Structure Interaction & Retaining Walls. Prof. San-Shyan Lin graduated from Chung Yuan University with a BSCE degree in 1981. He then obtained his master degree from Utah State University, Logan, Utah in 1985 and his PhD from Washington University in St. Louis, Missouri in 1992. Before his teaching career at university, Dr. Lin served as an engineer at Taiwan Area National Expressway Engineering Bureau between1992 to1994. Dr. Lin has been serving at Department of Harbor and River Engineering (DHRE) of National Taiwan Ocean University (NTOU) since 1994. He was promoted as a full professor in 2000. Thereafter, he took some university duties by serving as the secretary-general at office of the secretariat between 2001 and 2003; the chairman of DHRE between 2005 and 2006; the acting dean of college of engineering in 2007 and the vice president of NTOU between 2006 and 2012. Prof. Lin served as a committee member of committee A2K03-Foundations of Bridges and Other Structures of TRB, USA between 1995 and 2004. Currently, he is still serving as a committee member of TC-212 and ATC-1 of ISSMGE and as an editorial board member of four international journals. In addition, Dr. Lin also served as the president of Taiwan Geotechnical Society (2011-2013); Chairman of International Geosynthetics Society- West Pacific Regional Chapter (2002-2004); CEO of Sino-Geotechnics Foundation (2011-2014) etc. Dr. Lin received the distinguished alumnus award from Chung Yuan University in 2009 and the distinguish Engineering Professor Award from Taiwan Pavement Engineering Society in 2011. Prof. Lin’s research and practical experiences have been dealt with deep foundations and geosynthetics. Ir. Dr. Teik Aun Ooi obtained his Bachelor of Civil Engineering and Master of Engineering from Auckland Universiity in 1966 and 1968 respectively. He obtained his PhD from University of Sheffield in 1980. He was the Co – Organizing Chairman of the recently concluded SEAGC2016. 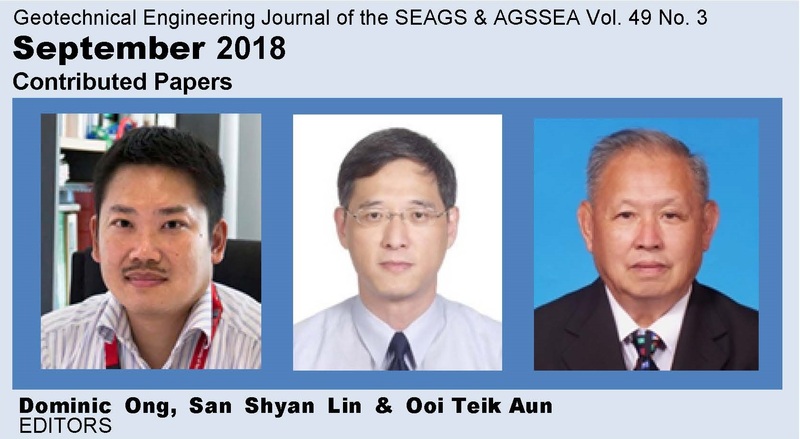 He is the immediate Past President of the Southeast Asian Geotechnical Society (SEAGS), Founder Chairman of the Association of Geotechnical Societies in Southeast Asia (AGSSEA). He is a Past President of the Malaysian Institute of Arbitrators (MIArb). He is the Immediate Past ICE Country Representative for Malaysia (2000 – 2015), Founder Chairman of IEM Tunnelling and Underground Space Technical Division (TUSTD), Founder Chairman of IEM Consulting Engineering Special Interest Group (CESIG), He is an Honorary Fellow of The Institution of Engineers, Malaysia (Hon. FIEM), Fellow of the Institution of Civil Engineers (CEng FICE), Fellow of the MIArb (FMIArb), Fellow of Malaysian Society of Adjudicators (FMSA) and Fellow of Asean Academy of Engineering and Technology (FAAET). Dr. Ooi has fifty years of experience in the Construction Industry. He spent his initial fourteen years with the Public Works Department Malaysia before leaving to work in the private sector where he spent seventeen years working in the construction sector. He play major role in the Johore Baru Causeway widening and the design and construction of Senai Airport in 1970s. He was the Project manager for the Wisma Saberkas Building Project in Kuching in 1980s. He was Project Director for the Design and Construction supervision of the New Kuching Deep Water Port at Kampung Senari in 1990s. He started his consultancy practice in 2000 specialising in Civil and Geotechnical Engineering works. Dr. Ooi is a practicing Consulting Engineer, An Expert Witness in Court and in Arbitration, An Accredited Checker, An Arbitrator and An Adjudicator. He is a member of the Accredited Checker Committee of the Board of Engineers, Malaysia. Dr. Ooi devoted much of his time in honorable public service in continuing education of engineers and development of Malaysia Annexes for Eurocode 7 and 8. He is an independent executive director of IEM Training Centre Sdn Bhd since 1992. In 2013 he was appointed executive director of the IEM Academy Sdn Bhd. 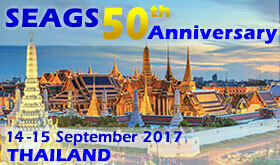 He has been Organizing Secretary and Chairman of numerous IEM Workshops, Seminars, and Conferences since 1970s. He was responsible for forming five active ICE Student Chapters in Universities in Kuala Lumpur. Dr Ooi conducted touring lectures in geotechnical engineering to Malaysia, Vietnam, Thailand, Cambodia, Laos, Myanmar and Philippines. In Malaysia he was invited to deliver the prestigous 19th Professor Chin Fung Kee Memorable Lecture in 2009. He frequently delivered lectures to the final year University engineering students. There are thirteen papers in this Issue: The first paper is by Hai-lei Kou and Wen-gang Zhang on Strength Characteristics of Soda Waste Treated with Fly Ash and Lime: Soda waste is a kind of industrial waste when traditional technology of soda production is adopted. The soda waste cannot be directly used as engineering soil as its low strength. However, it can be used after be mixed with other materials. In this paper, chemical materials such as fly ash and lime are used to be mixed with soda waste. The strength characteristics of soda mixtures with different ratio are studied in detail. Compaction test and unconfined compressive test are conducted respectively to assess the feasibility of these two materials. Based on test results, the mechanical properties of soda mixtures with different ratios of fly ash and lime are discussed. It is indicated that the microstructure of soda waste is similar with soil and the particle size distribution is well to mix with other materials to be used as engineering soil. The optimal ratio of soda waste and fly ash is 7:3 while the ratio is 7 % for soda waste and lime. Using the optimal ratio, the unconfined compression strength of fly ash treated soda and lime treated soda after 14 curing days is 6.5 and 6.1 times of pure soda respectively. The second paper is by A. Puttiwongrak, K. Sam Ol1 and V. Sakanann on Groundwater Recharge Estimation in Kathu, Phuket using Groundwater Modelling: Kathu is a district of Phuket Island in Thailand, and is the district with the largest number of communities in Phuket. Groundwater is the main water supply on Phuket. Urbanization is occurring very rapidly on Phuket and this has stimulated water demand at an accelerating rate. A lack of fresh water and the results of over-use of groundwater could be serious problems in Phuket in the near future. The study described in this paper simulated groundwater recharge flux in Kathu, using groundwater modelling to estimate groundwater recharge. The simulation was carried out across the locations in Kathu for the period, 2006-2016. Historical Groundwater well data were collected and used to create a groundwater model. The trial and error method was applied to the recharge flux to obtain matches between simulated and observed groundwater heads or levels within acceptable ranges of error. Finally, it was concluded that the groundwater recharge in Kathu is currently able to maintain the groundwater level, although groundwater has been withdrawn at a highly accelerating rate, especially between 2012 and 2016. The positive trend in the recharge rate can be attributed to increasing efficiency in the use of water catchment areas, high rainfall, and rising sea levels. In the third paper, A. Imtiaz, A. Barua, M. Sakib and M.A. Ansary; describe Seismic Microzonation of Cox’s Bazar Municipal Area Bangladesh: Cox’s Bazar municipal area runs a high risk of earthquake exposure due to geologic and tectonic structures. As a part of adopting earthquake mitigation approaches for the region, a seismic microzonation map was developed on the basis of potential of earthquake occurrences and ground susceptibility to earthquake. For microzonation purposes, a total of 26 borelogs were used to study site amplification as well as soil liquefaction potential of the municipality area. Site responses were estimated through one dimensional wave propagation software SHAKE. The liquefaction potential was evaluated using two simplified procedures, proposed by Seed et al. (1983) and Iwasaki et al. (1986) to measure whether the site is liquefiable or non-liquefiable. For slope stability analysis, XSTABL programme was used which performs two dimensional limit equilibrium analyses to evaluate the factor of safety for a layered slope using the simplified Bishop Method. These results were transformed into a map which will serve as a general guide to ground-failure susceptibility, effective land use, and efficient town-planning. In their paper (fourth one), M. R. Selamat, A. Shafie, R. Saad, and M. M. Nordiana on Geophysical Investigation in Bukit Merah Reservoir : The suspected cavity presence in the bedrock of the outlet canal of Bukit Merah Reservoir in Malaysia raised concern that it could undermine the integrity of a check pier structure planned just ahead of the spillway. Boring into a cavity could also compromise reservoir containment capacity. A seismic refraction and electrical resistivity tomography carried out for the subsurface section spanning the two banks revealed not only the presence of a relatively porous zone towards one end but also the undulating material boundaries towards the other. The results called for review of the original foundation of the check pier structure involving bore piles of equal length. The suspected porous zone was avoided in the renewed bore pile design while the bedrock depressions were appointed with deeper bores for adequate pile embedment. The design review resulted in piles resting on a stratum of equal geotechnical quality with each new pile now having a different length. The fifth paper is on Effect of Ground Disruption on the Strength of Gatch Soil in Kuwait by Ziad Abdelsalam and Nabil Ismael: Kuwait soil is commonly known as ‘Gatch’ and classified as very dense cemented sand Kuwait sand has sulphates and calcium carbonated in form of gypsum components that caused cementation bonds with environment aids such as highly evaporation of rainfall in winter season. This soil is used as a backfill material and it is important to know the effect of excavation and recompaction on the strength characteristics. The present study provides experimental results on the effect of ground disruption on strength parameters of cemented sand in Kuwait, such as they are the cohesion c, and the angle of friction ϕ’ and stress strain characteristics. The triaxial test was used to determine these parameters on undisturbed and remolded specimens at different depths. The results show a disturbance of cemented sands cause loss of the cohesion component of strength and a minor reduction in the angle of shearing resistance. In the sixth paper is on Greenheart Timber Strip Reinforcement for Reinforced Soil Retaining Walls by Sean A. Surujdas and C.N.V. Satyanarayana Reddy: This article presents the result of investigating the feasibility of using greenheart timber strips as reinforcement for reinforced soil retaining walls in Guyana. The work is intended to assess the cost economics between greenheart timber strips and geogrids as reinforcements. Medium grained river sand is used as fill material in reinforced soil retaining wall designs. The interfacial friction between greenheart timber and fill material is determined by the laboratory pullout test. The designs of reinforced soil retaining wall revealed that Greenheart timber strips of 350mm width and 25mm thickness are sufficient to reinforce retaining wallswith backfill of heights 4m and 6m, while greenheart timber strips of 350mm width and 50mm thickness are sufficient to reinforce retaining walls with backfill of heights 8m and 10m. It is observed that as height of retaining wall increases from 2m to 10m, the percentage cost saving of using greenheart timber strips as compared with geogrids, increases from 10% to 24%. In the subsequent seventh paper in the series Yudhi Lastiasih and Herman Wahyudi present the HWYL Method for Predicting Settlement of Soft Soil: The HWYL method is one of the analytical methods for predicting the amplitude and time of settlement that occurs, based on the field observations using a settlement plate or extensometer. The data used for the analysis was the result of observations from a settlement monitoring instrument of some road embankment and reclamation projects on soft soil in Indonesia. The data was analyzed using a statistical approach to determine the behavior and correlation of settlement amplitude versus time curve shape. This method obtains an equation formula to predict the consolidation amplitude and when the final settlement of last embankment occurred. Sengara, IW., Roesyanto, Krisnanto, S., Jayaputra, A. A., and Irsyam, M. in the eighth paper deal with Bearing Capacity and Settlement Study on Small-Scale Piled-Raft Groups in Sand: Pile group foundation with a pile cap can be considered as a piled-raft foundation. Previous studies indicate that in a piled-raft foundation, the piles contributes to reduce settlement of the raft whereas the raft provides an additional bearing capacity of the pile group. Laboratory testings were performed to investigate the performance of piled-raft group from bearing capacity and settlement point of views. Instrumented laboratory models of 2×2 and 3×3 piled-raft group were loaded vertically to obtain load vs. settlement curves and load-transfer to raft, to pile shaft, and to pile tip. From the load-settlement curves of piled-raft group, the performance of bearing capacity and settlement was then observed and quantified. The laboratory test results indicated that the presence of piles reduced the settlement of raft significantly, whereas the presence of raft provided additional bearing capacity to the pile. Wang Ning, Zhou Xiaolong and Zhu Dengyuan are the authors of the tenth paper on Failure mode for creep area of high open-pit slope under the influence of underground mining: With mining intensity increasing, more and more deep open-pit mines are gradually transformed to underground mining in China nowadays. Focusing on high open-pit slope under the influence of underground mining, the spatial distribution and development trend of slope displacement monitoring data were analyzed, combined with calculation of slope stability under different engineering conditions. The results show that the slope deformation has a periodic change with the seasons, and the rainy season is the most intense period of deformation development, when the tensile cracks on the top platform of the slope become seepage channel for rainwater. The slope stability coefficient of the creep area under the drainage condition is 1.010 and the most dangerous sliding surface is located in the upper part, whereas sliding zone is obviously reduced compared to saturated condition and dangerous sliding surface also decreases, and reasonably slope cutting can largely improve the slope stability. By studying the deformation process of high open-pit slope, the deformation development characteristics and possible failure modes are got, and it could provide guidance to the reinforcement measures of landslides and ground subsidence. The eleventh paper b Nabil Ismael and Hasan Al-Sanad is on the Properties of Desert Sands Reinforced with Ground Tire Rubber in Kuwait: The abundance of waste tires in Kuwait created a major problem requiring disposal sites and causing environmental and safety problems especially in the summer months as the temperature often exceeds 50C. Numerous fires have occurred causing air contamination and health hazards. To find useful uses of ground tire rubber an extensive laboratory testing program was carried out using rubber aggregates produced locally as additive in small quantities up to 20% by weight to the local surface sands of Kuwait. Testings included grain size, unit weight, Modified Proctor compaction, permeability, direct shear, consolidation, and CBR tests. The effect of increased rubber content on the different properties was measured. The results indicate a reduction of the density and CBR, an increase in the permeability and compressibility and no change in the angle of friction  with increasing rubber content. Therefore, the use of rubber additive is beneficial for many practical applications such as light weight fill, as a drainage layer, and on the grounds of sporting facilities, and in embankment construction. The twelfth on a study on behavior of vertical pile in sand under uplift load by R. Saravanan and P.D. Arumairaj: The significant design parameter for supporting the piles and the ground anchors for tension loads and compressive loads is shaft resistance. Steel pipe piles often mentioned as cylindrical piles are used often in offshore projects and in harbor structures. Since the end condition of the cylindrical piles (open and closed end) plays a significant change in the shaft capacity of the pile, an experimental study is proposed to predict the load displacement characteristics of single vertical pile subjected to uplift load. The pile is embedded in sand with varying relative densities. The analytical study was developed based on the failure mechanism from limit equilibrium technique. The present study takes into account of significant parameters such as length, diameter and as surface characteristics of pile. The axial load-displacement behavior of vertical pile is studied under the different length to diameter (L/d) ratio which is adopted for the experimental analysis. The uplift co-efficient (Ku) is evaluated by using ultimate uplift capacity load. The obtained experimental results were compared with the reported data to elucidate the significance of the work done. The last paper of this issue is the thirteenth paper on Numerical Simulations of K0 Triaxial Tests on Collapsible Porous Clay by J.C. Ruge, A. López, F.A. Molina-Gómez, R.P da Cunha and J.E. Colmenares: This paper addresses numerical simulations of K0 triaxial tests performed using a single element program. The methodology was based on construction of numerical models with three different constitutive models in order to represent the soil behaviour during stress path states. The constitutive models used were (i) the Mohr-Coulomb, (ii) the Cam-Clay, and (iii) a hypoplastic model. The material used was a collapsible porous Brazilian clay. The values obtained were compared and calibrated with experimental data. Results show that it is possible to assess soil behaviour via a single element program and that triaxial K0 stress path tests can be simulated with numerical methods. Results show that it is possible to replicate and calibrate soil behaviour under zero lateral displacement using computational tools. Thirteen papers are contained in this issue. No doubt the material contained herein would be most valuable to our profession. The editors have adequately described the contributions in the preface. They are to be congratulated for these contributions.